Surprise giveaway time! 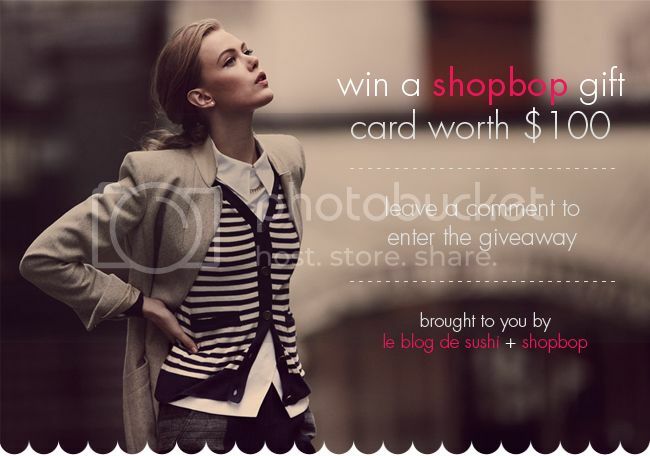 The lovely team at Shopbop has offered Le Blog de Sushi readers the chance to win a $100 gift card to spend on whatever your heart desires on the Shopbop online store. If I had a $100 gift card, I would be tempted to invest in a gorgeous winter coat: perhaps a Diane von Furstenberg coat, a Elizabeth & James coat or a Rebecca Minkoff coat? ♥ Comment on this post and make sure I am able to contact you if you win. As this giveaway is for Le Blog de Sushi readers, make sure you are a follower on Facebook or Twitter. ♥ Giveaway closes Tuesday 27th November and the winner will be picked randomly. This is a great giveaway! Count me in please. I have been one of your readers for a while now. I follow you on Google Reader, but also on Twitter. You can contact me here. Made a tweet on Twitter. Name on Twitter is truestar05. Amazing giveaway! I am addicted to shopbop! oohh how fun!! i'm in. i also tweeted about it! thank you for this giveaway~! I'd love to win this prize and am a regular reader of your lovely blog! I love shopbop! I would definitely invest in a helmut lang blazer, the cut is amazing! Hi! What a great prize! If I won, I'd buy a beatiful necklace by Gorjana or House of Harlow. Thank you! following you on twitter. i looove shopbop! I'd like to get a pair of new boots, thank you. Thanks for the awesome giveaway! I loved your blog for a long time! I follow you on Facebook and Twitter. Thank you for the giveaway! 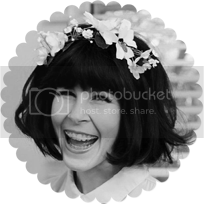 I follow on Bloglovin'... Hope that's okay! My email is: anscenicworld(at)gmail(dot)com, if I'm lucky. Thank you for this great giveaway! I am really wanting to get a great pair of jeans at Shopbop! Following on Twitter as catholicfanatic. hi, thanks for the opportunity! i follow you on facebook and name is amy lizbeth breckenridge. if i win i can be reached at cupcakesncouture@gmail.com. I love Shopbop, fingers crossed! Following you on Twitter (@hollymarie076). ooh what a great giveaway! Sounds like a great giveaway just in time for the holidays! This is so awesome! My shopbop list is by far exceeding my budget! That's an amazing giveaway!! I'm following you on Blogger and also Facebook! I've been following your style for a while, it's a huge inspiration to me. I'm in! I follow Le Blog de Sushi on Twitter. thanks for the giveaway! ilove shopbop!!! I liked your fb page! Great giveaway! I'd love to win! I'm following you on facebook. Online shopping is the death of me!! following on both twitter and facebook! I follow you on facebook! What a neat giveaway! This is the perfect Giveaway! Love Shopbop; throwing my name in the hat. Thank you! I've "Liked" your page on Facebook. (jaynawallace (at) gmail (dot) com) - thanks! I've also tweeted about the giveaway here: https://twitter.com/RatsOnParade/status/271200400454066176 Thanks! This is a fabulous giveaway - thank you so much! Followed on Facebook and GFC as Tian Ayubi. I just followed you on Twitter, didn't even realise you were on there. Awesome giveaway. Thanks for the great giveaway, fingers crossed! What a great giveaway, thats for the reminder on facebook!